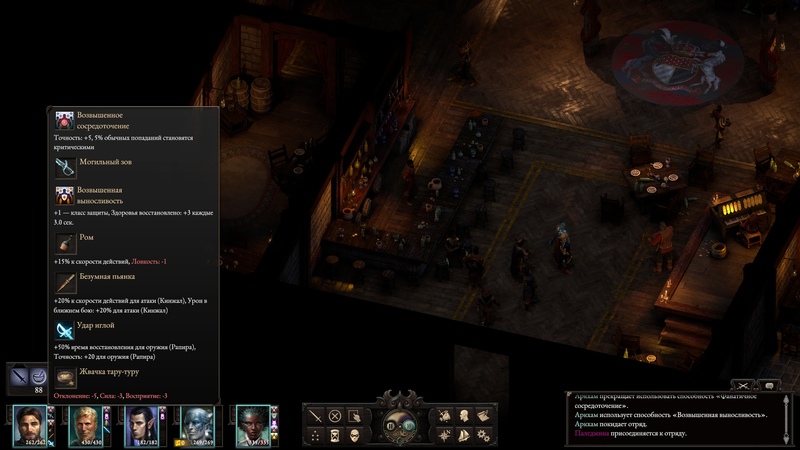 As you can see on screenshot party is affected by 2 paladin auras with only 1 paladin in the group, when i remove hired paladin his Exalted Endurance stays active on protagonist (also stays active on Pallegina that wasnt part of the party the moment 1st screenshot was taken, but she was affected by Exalted Endurance of the same mercenary previously). 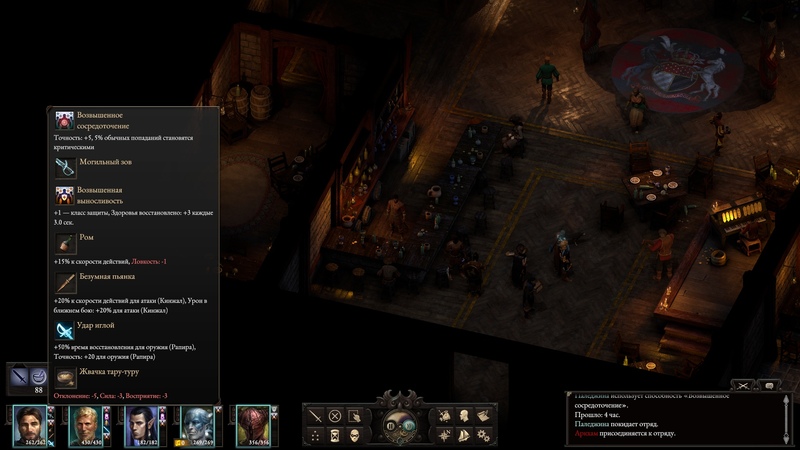 Note that aura dissappeared from companions (but not Watcher) and stayed on Pallegina. If i remove Pallegina then Watcher, Aloth and Eder (but not Tekehu) will still have Exalted Focus active. Save link below. Edit : Also Watcher has Grave Calling effect in UI and in character sheet active effects list even with the sabre being in the stash (not even inventory) just like Eccea's arcane blaster that stays active and doubles any projectiles affected character launches. Edited by AttonRand, 29 July 2018 - 06:49 AM. 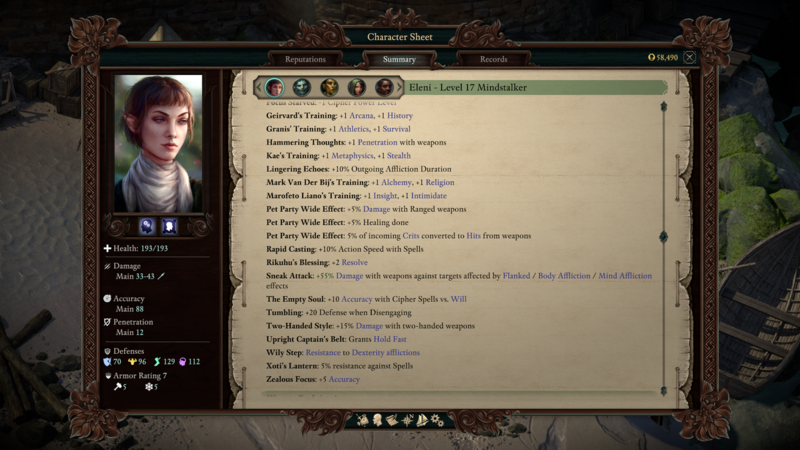 Even when there's no Paladin in the party, several of my party members still get the bonuses from Zealous Focus and Exalted Charge. Also, I seem to have three Pet Party Wide Effect bonuses active at once. Even after I swapped out two of those pets, it seems like I still kept their party wide bonus. That can't be right, can it? EDIT: I've found it out that when I put a pet into the slot, directly swapping it for another pet, I keep the pet party wide effect (or at least the text saying that it's active). If I take the old pet out of the slot first, emptying the slot, before I put the new pet in, the text disappears. And I seem to have the Deadeye drug crash penalty still active even after resting. Oops. I didn't realise that resting at a shrine (which is where I got Rikuhu's Blessing) doesn't get rid of drug crash penalties. Does it not get rid of injuries either? I've tried to add my save game file as well, but at 4357kb apparently it's too big to upload. Edited by Chandagnac, 01 August 2018 - 07:28 AM. "Fixed an issue where Pallegina's Exalted Focus buff would stay on the party after she was removed from the party." You should check if it's still there after the DLC/patch goes live. Well, that's good. But my problem was with Pallegina's Zealous Focus and Exalted Charge, not Exalted Focus. Is it likely that the fix for Exalted Focus will fix the problems I was having as well? Edited by Chandagnac, 01 August 2018 - 09:21 AM. No clue, but we'll find out soon enough. No, it seems to have made no difference. Several of my characters still have Zealous Focus and Exalted Charge even when there is no paladin in the party. I would like to attach a copy of my saved game, but because my savegame files are around 4400kb each, apparently they are too large to upload to this forum using the 'Attach Files' option. Is there another way? Upload them to dropbox, then drop the link here. Just found this happening with my party, I am running 3x Party Wide Effect bonuses from pets Running version 3.0 - sorry if this is old and I am bringing it up just noticed it though and it is the first time this has happened.